Among the early millionaires to reside in the Chelsea Parade area, Lucius Wyman Carroll (1815–1900) contributed to its reputation as a fashionable residential district by building this handsome house with his wife Charlotte Pope Carroll in 1850. Carroll made his fortune selling manufacturers’ supplies, dyestuffs, paint, oil, and glass. He was also a partner in the Occum Water Power Company, owned a cotton mill in Griswold, and served on several Norwich bank boards. 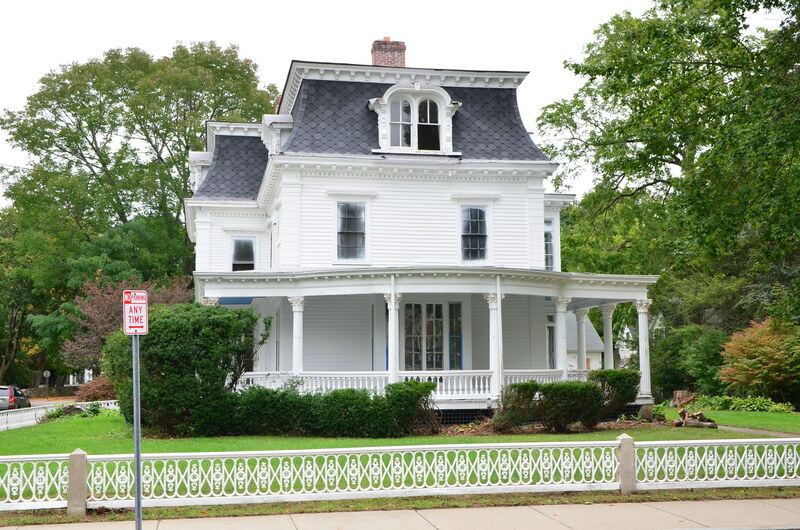 In 1871 the Carrolls remodeled their house with its distinctive slate-clad mansard roof. At the time, the country was being swept by the so-called “mansard craze,” which became something of a national epidemic during the boom period following the Civil War. The elaborate cast iron fence running along Broadway was undoubtedly added at the same time. The porch was enlarged in 1912. In 1887 Carroll commissioned architect Stephen C. Earle (#3, #22) to design a commercial building at the intersection of Water and Main Street as an investment. The Carroll building (Flatiron Building) remains a much-admired downtown Norwich landmark, listed on the National Register of Historic Places in 1982.